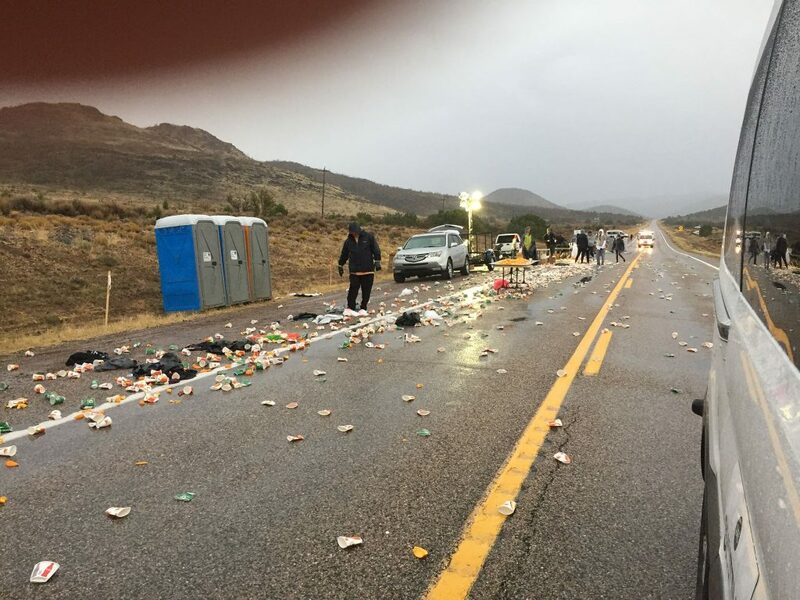 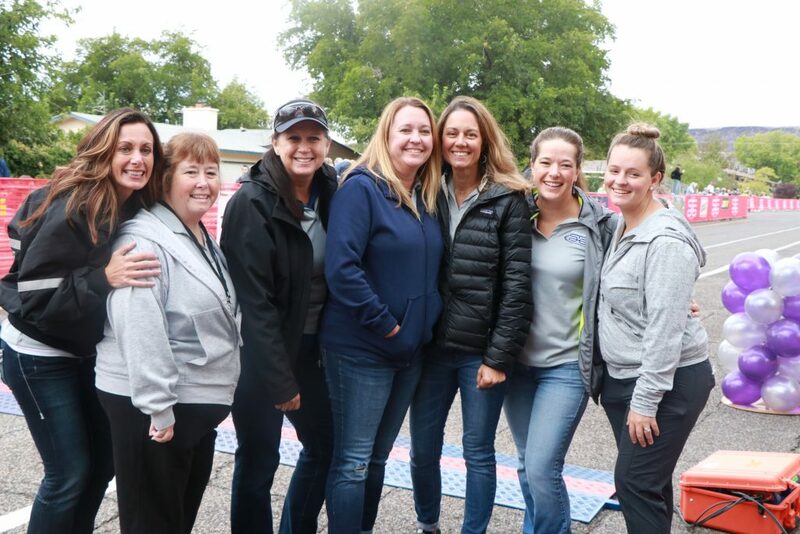 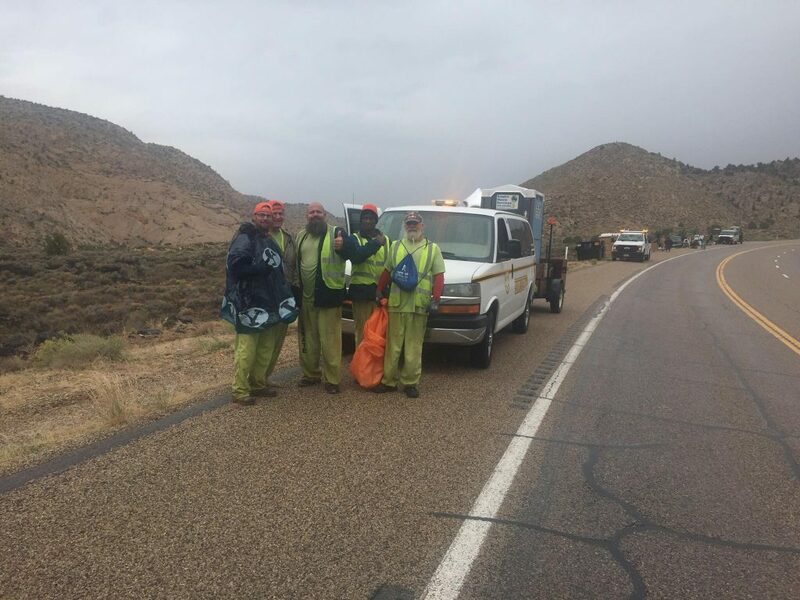 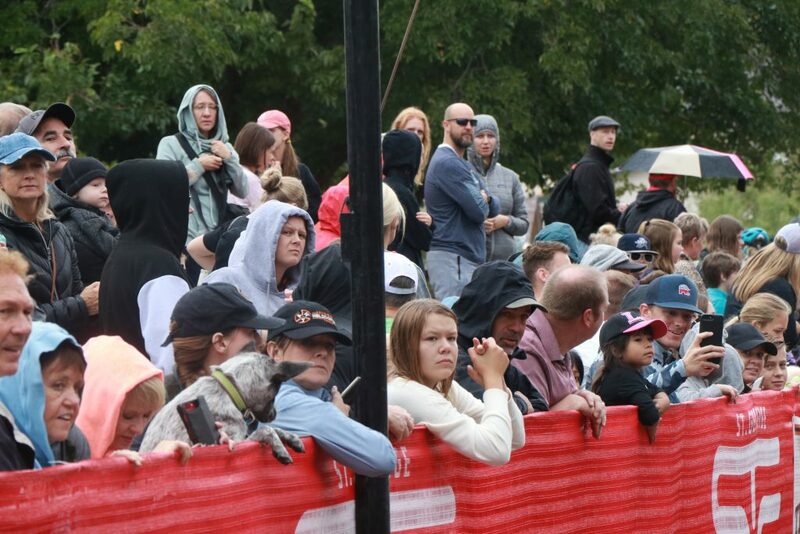 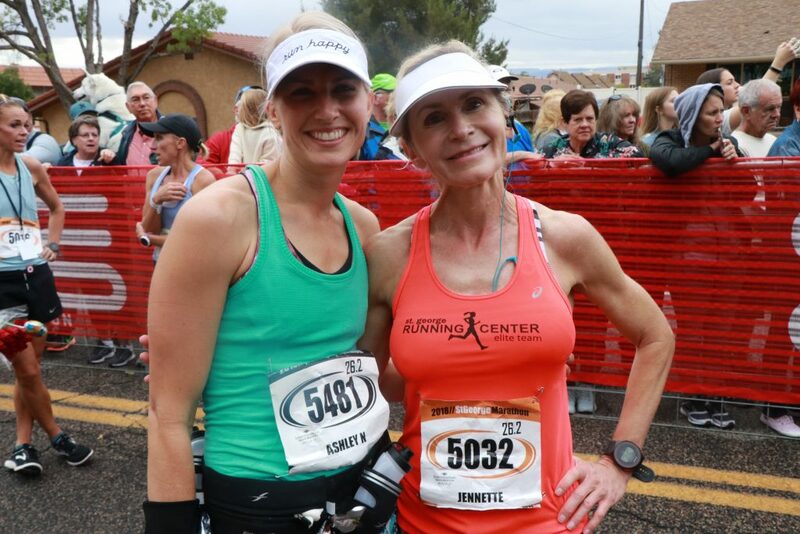 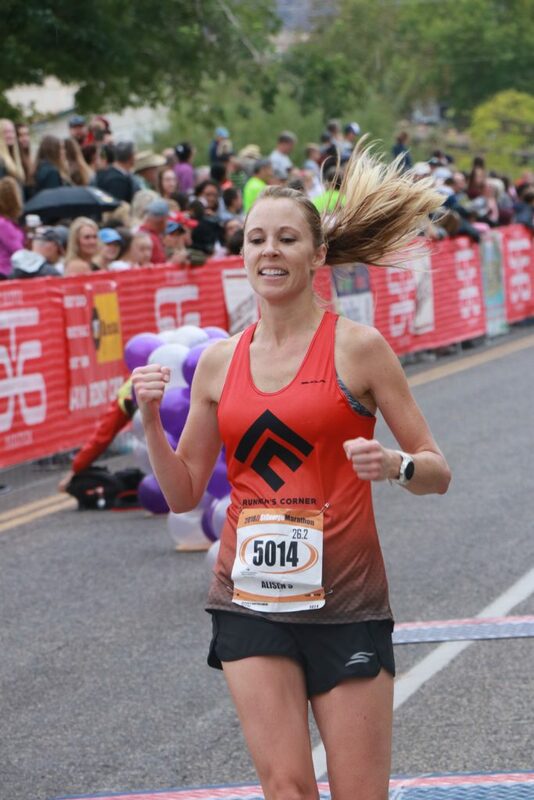 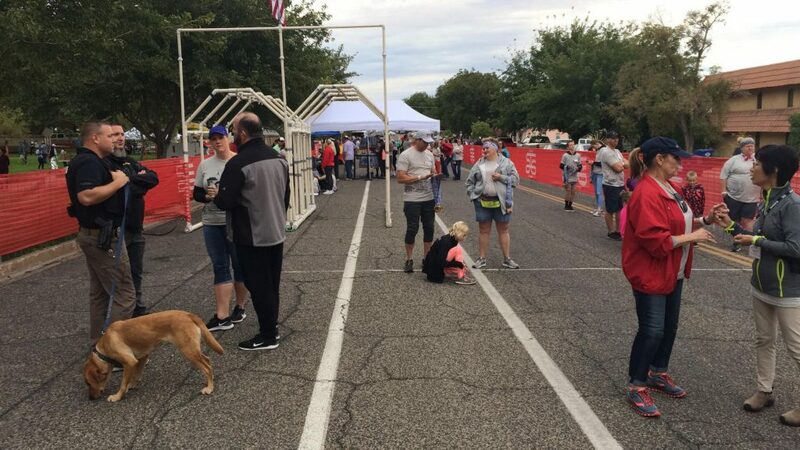 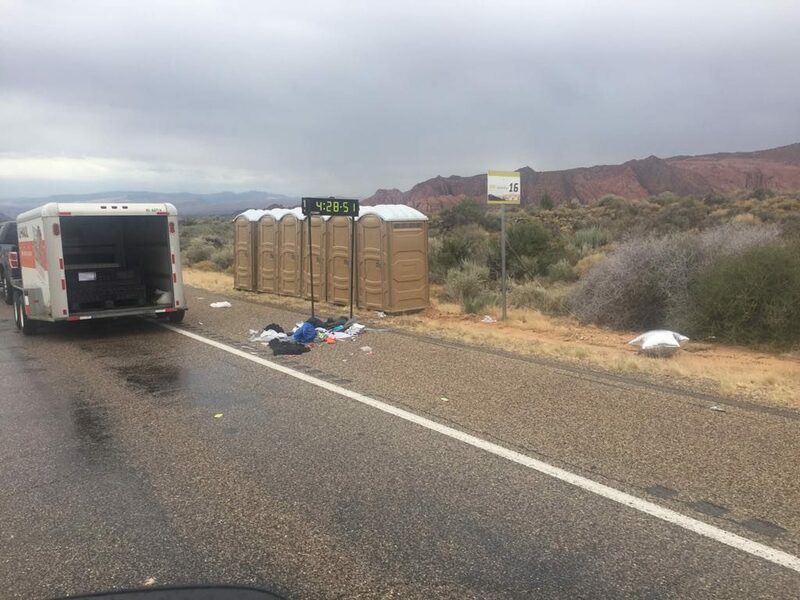 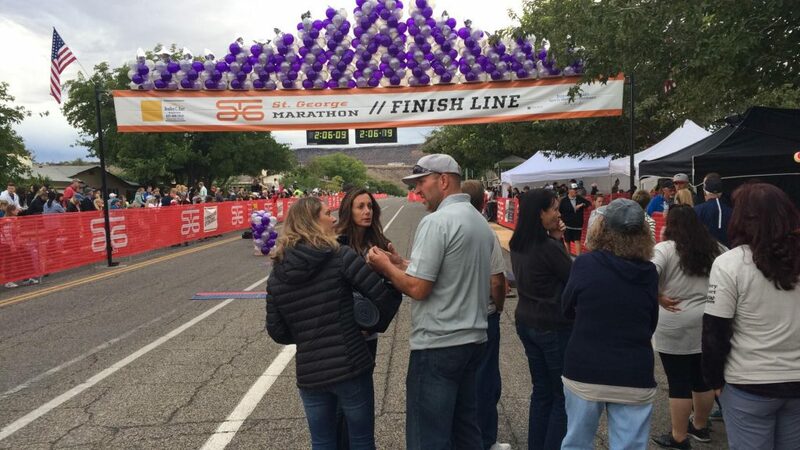 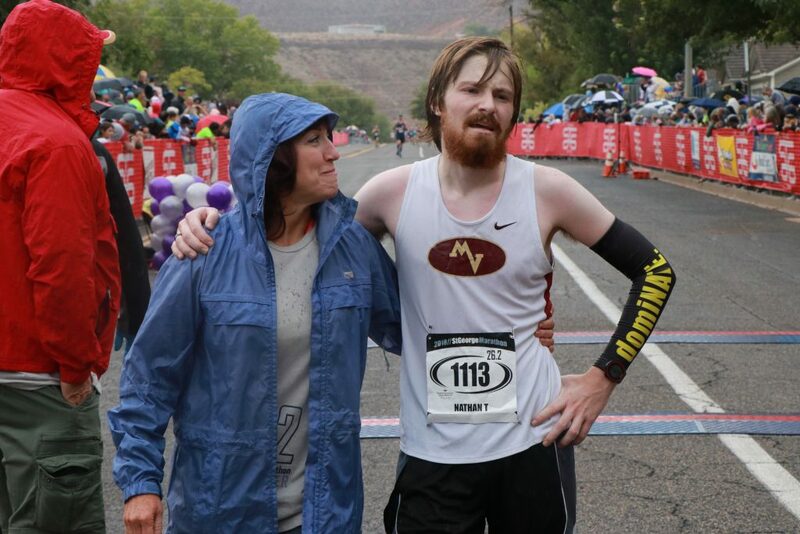 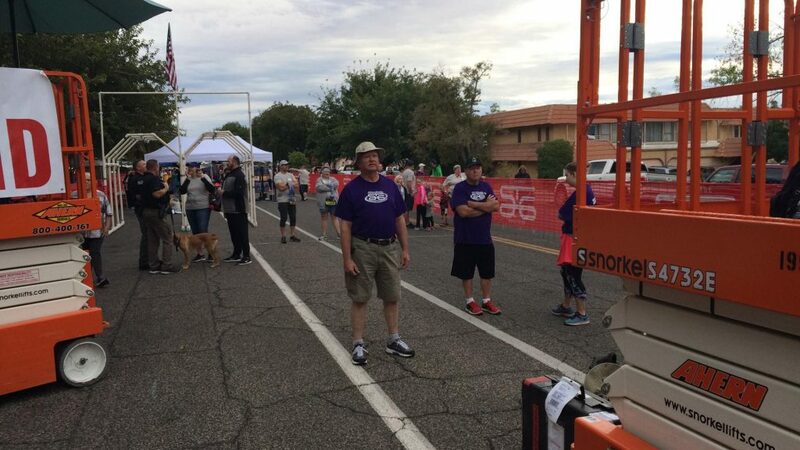 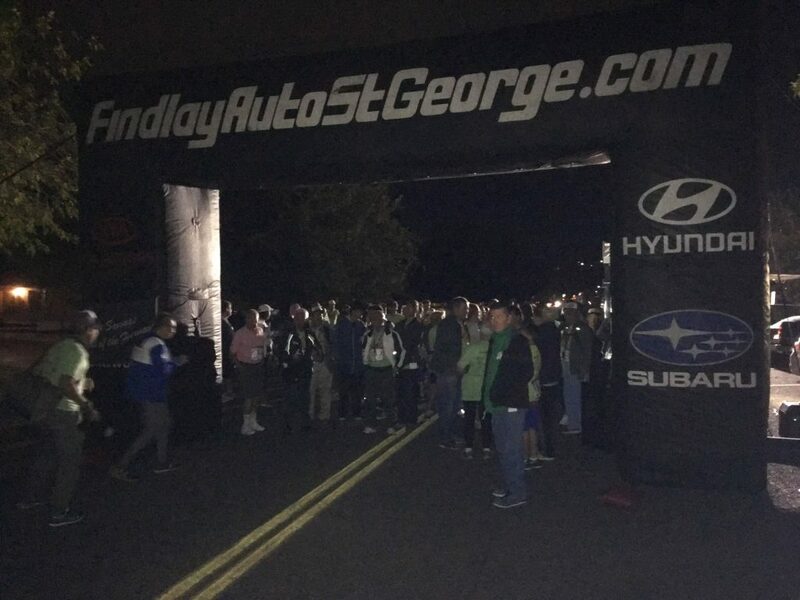 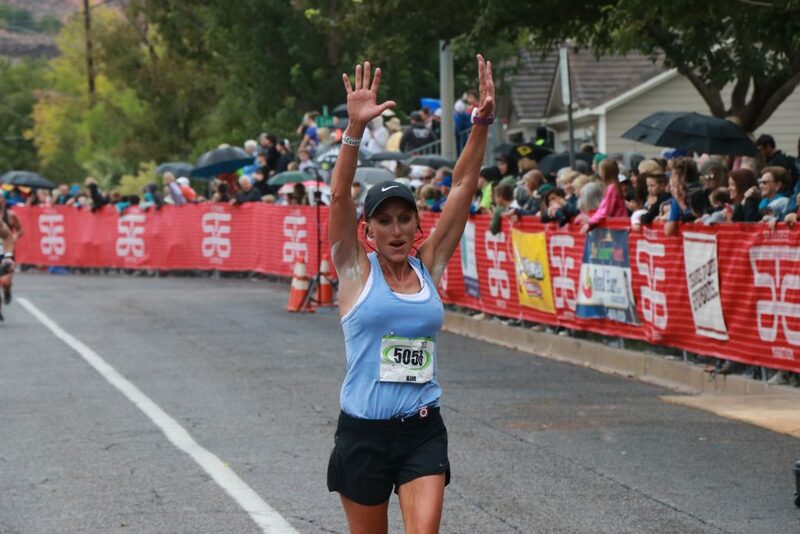 ST. GEORGE — The weather was a bit wet but otherwise ideal as thousands of runners took part in the 42nd annual St. George Marathon Saturday, making their way to the finish line under overcast skies with temperatures in the low 60s. 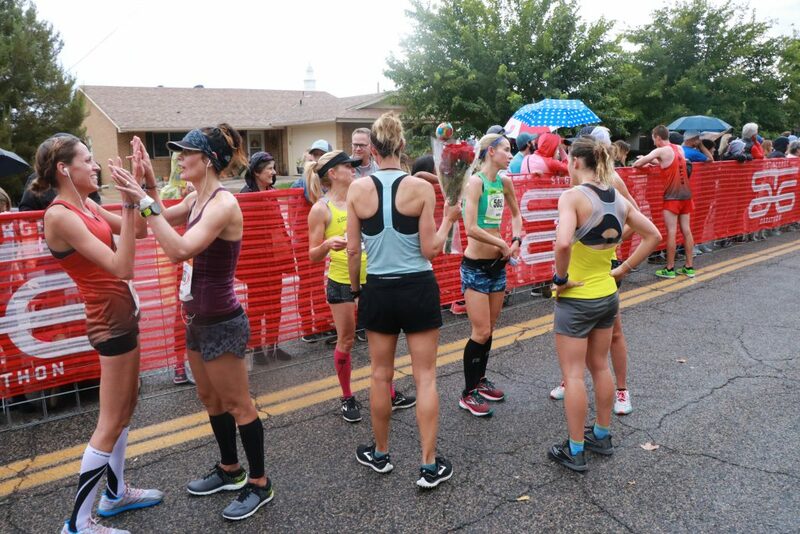 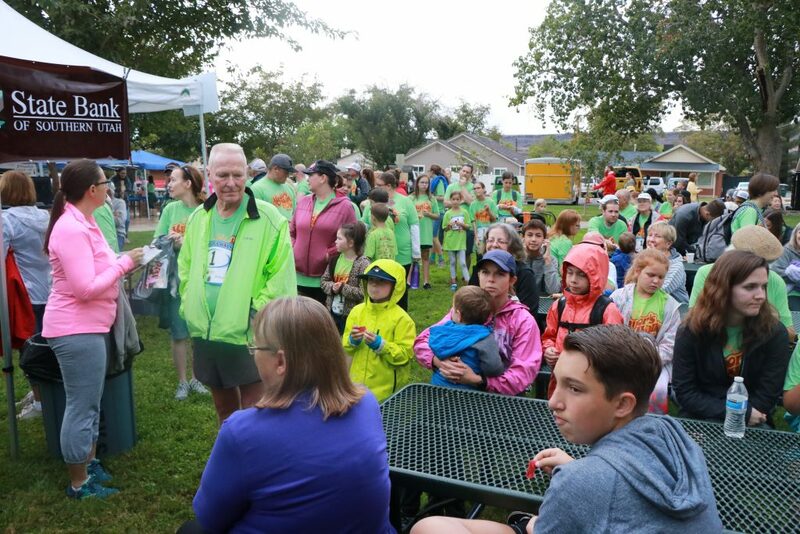 Intermittent rain fell on the runners as they made their way to the finish at Vernon Worthen Park, many of them being cheered on by family members and friends. 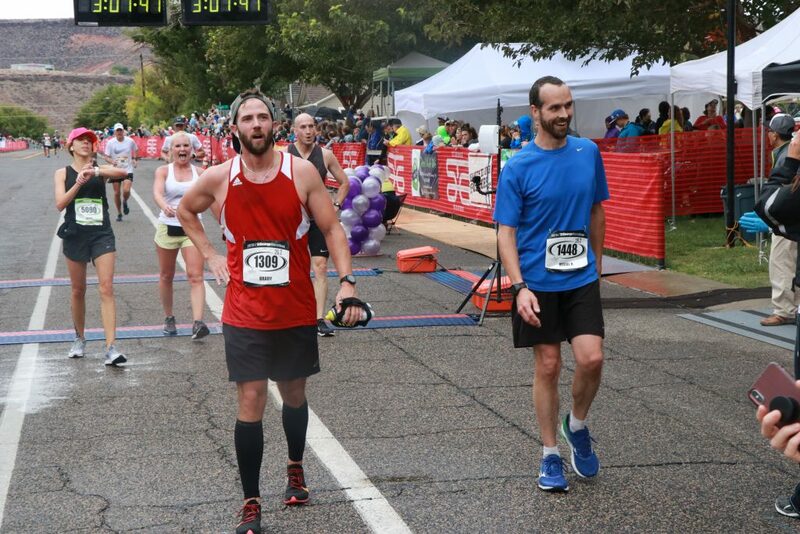 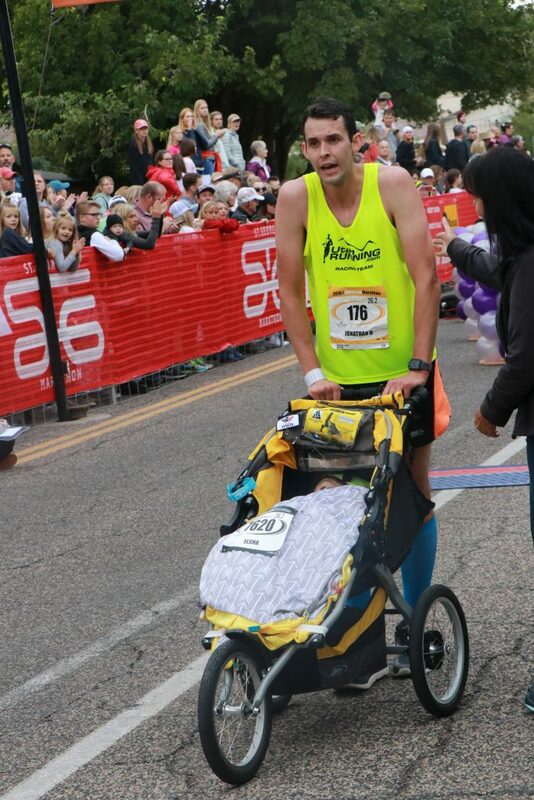 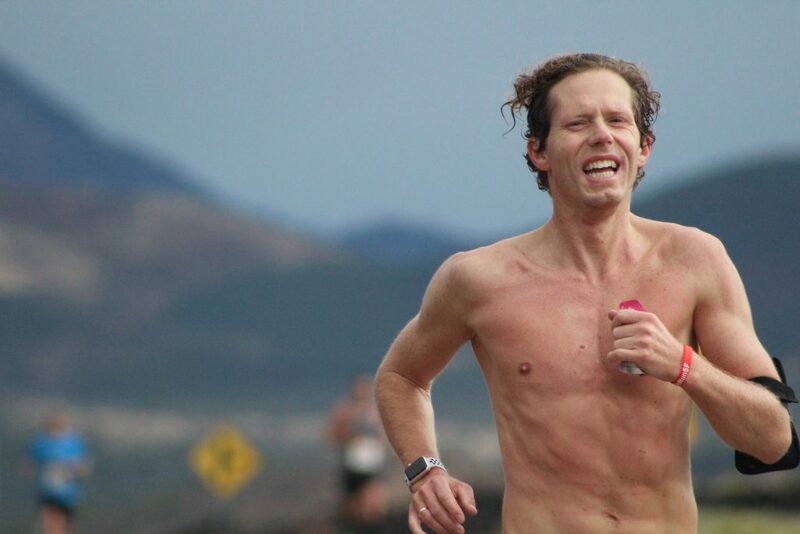 Jonathan Kotter, 33, of Holladay was the top overall finisher, completing the race in a time of 2 hours, 16 minutes and 18 seconds. 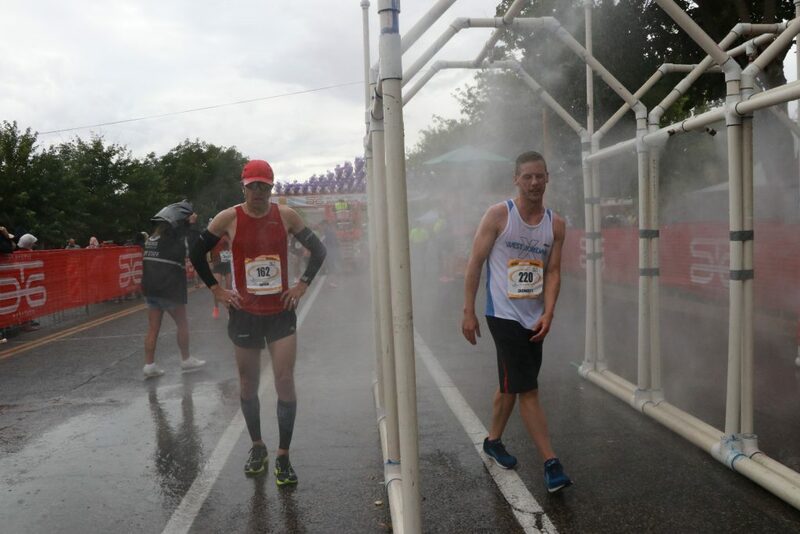 Kotter said the start was a bit wet, so he ran conservatively to begin with, right behind eventual second-place finisher Riley Cook, 37, of South Weber. 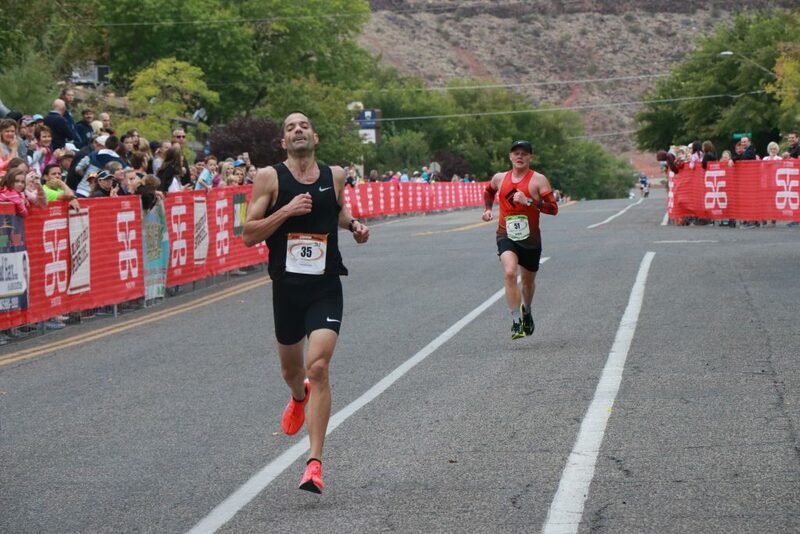 At about the 16th mile, Kotter was able to pass Cook and take the lead for good. 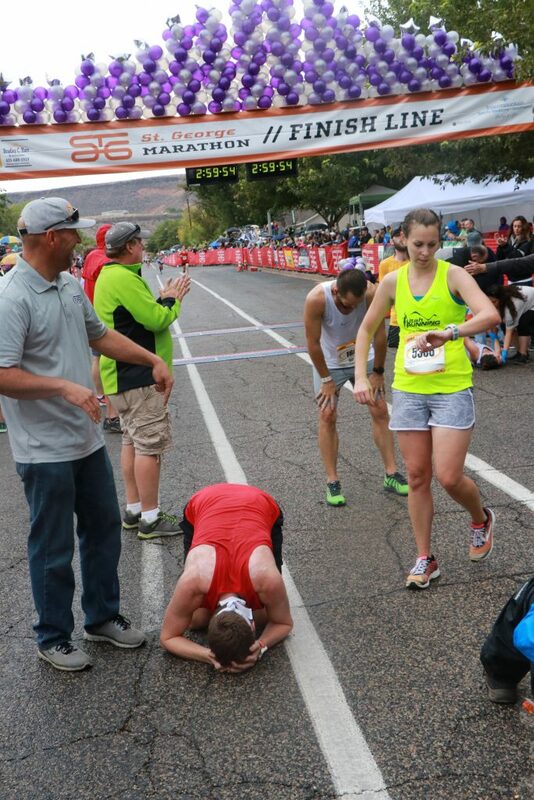 Cook’s runner-up time was 2:17:06. 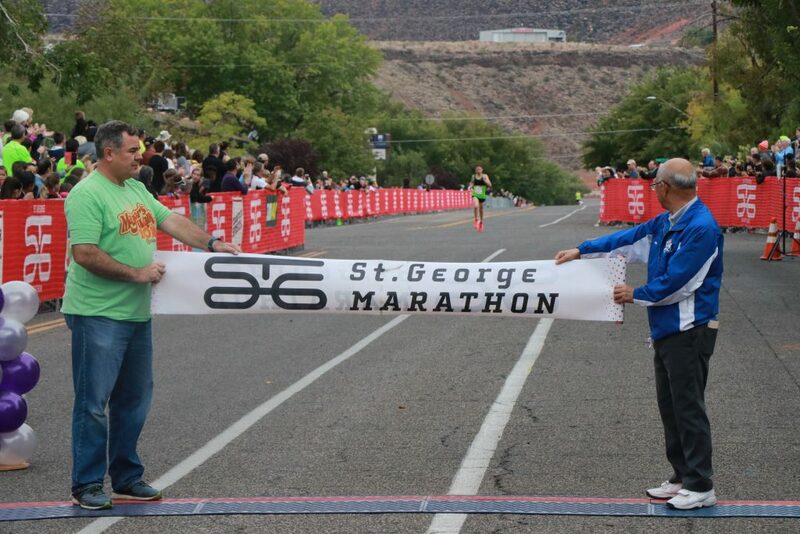 Aaron Metler, 34, of St. George finished third overall for the second straight year, crossing the finish line in 2:19:22. 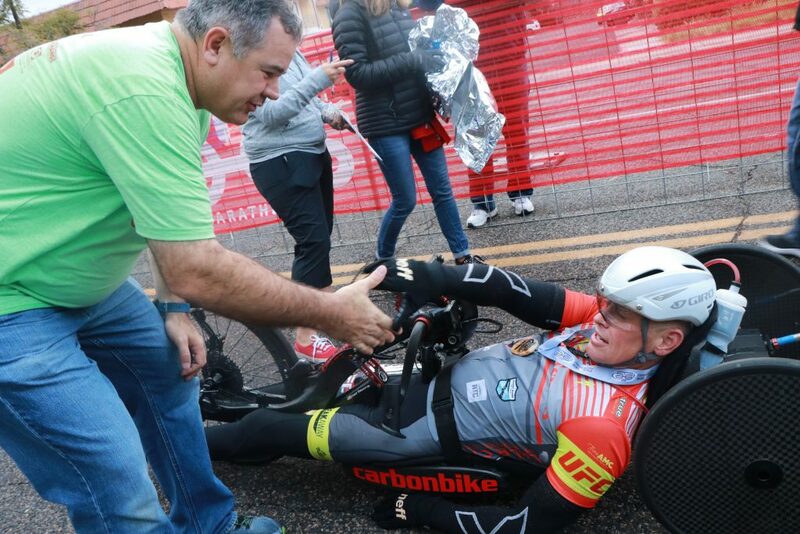 Metler was among the many racers who said they appreciated the cooler weather. 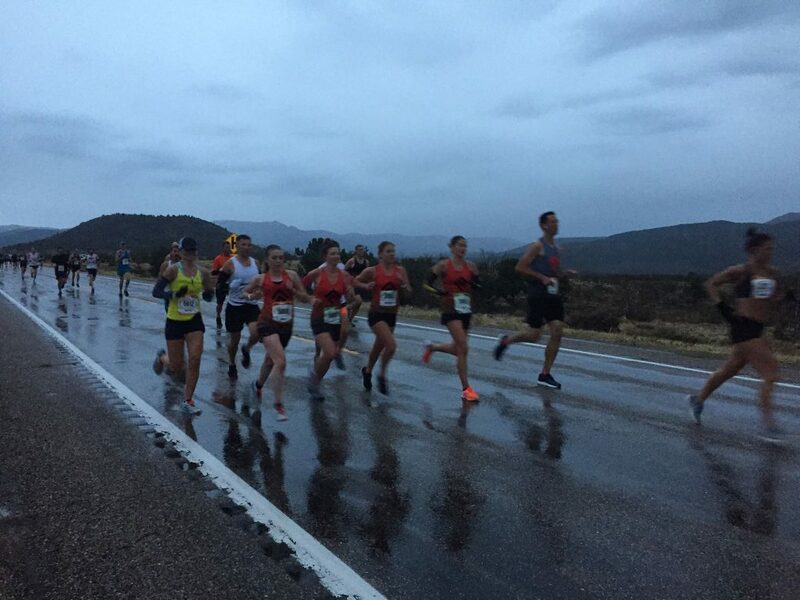 “Overcast is nice, the weather was cool, and always good competition,” Metler said of the running conditions. 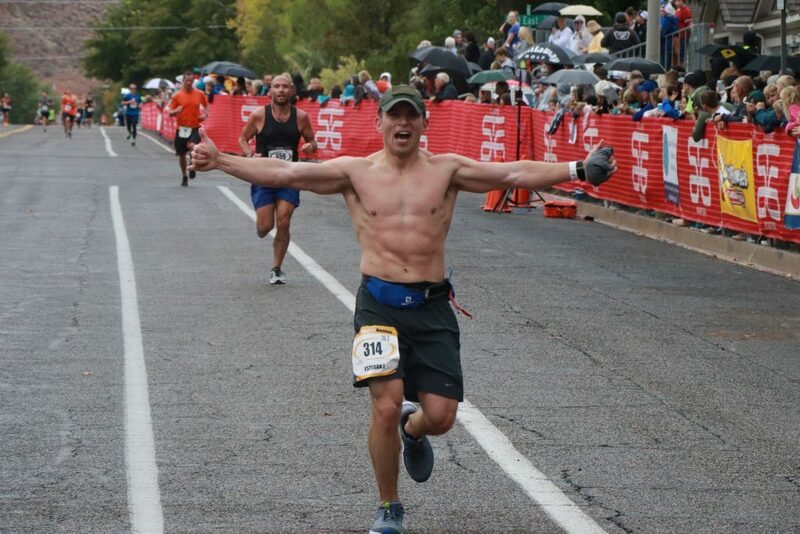 “You can’t ask for better weather. 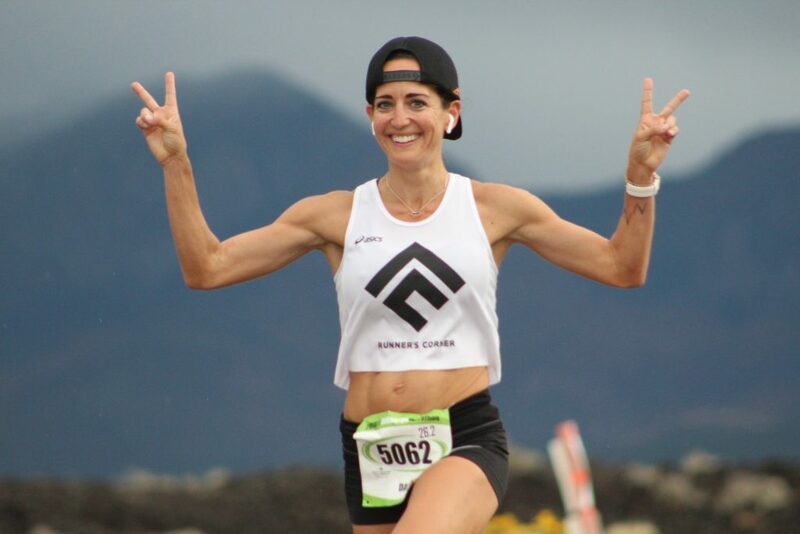 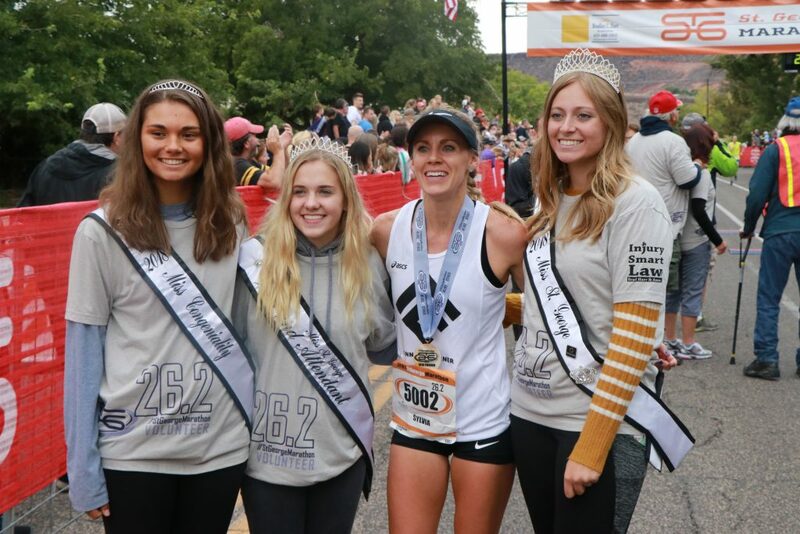 It was amazing,” agreed Sylvia Bedford, 28, the top overall female finisher, who clocked a time of 2:38:04. 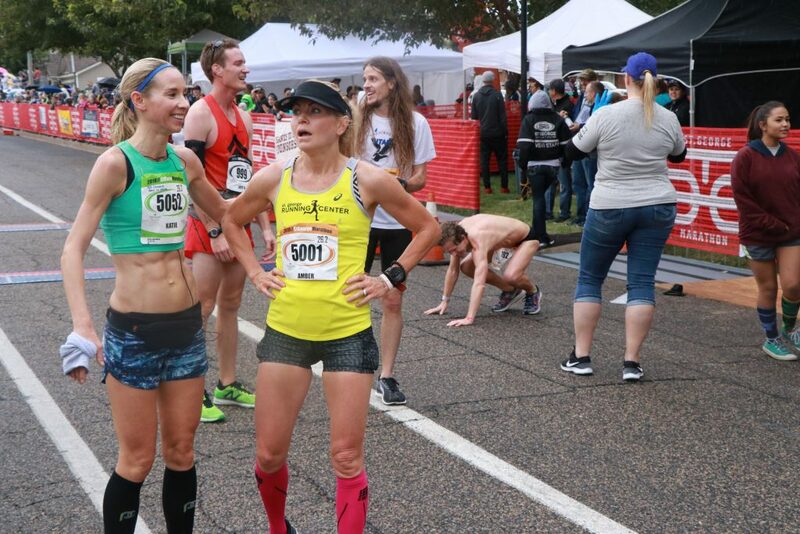 Bedford said about 10 miles into the race, she was able to put some distance between herself and the next couple female racers. 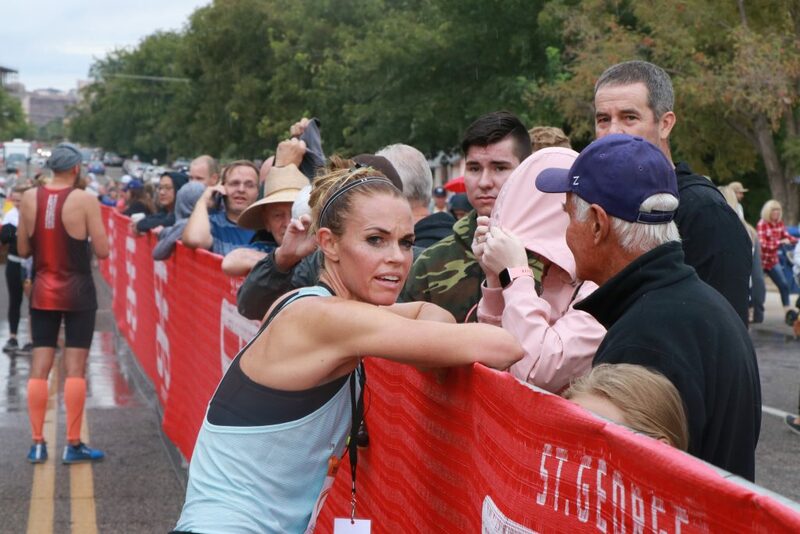 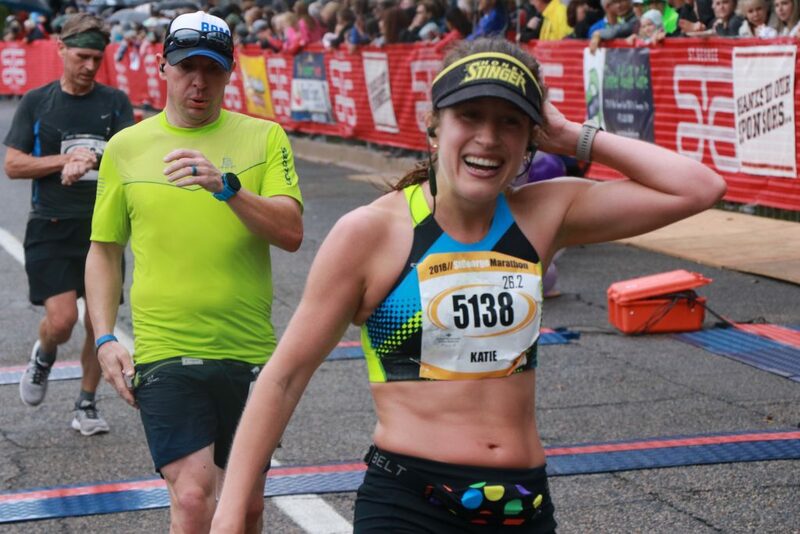 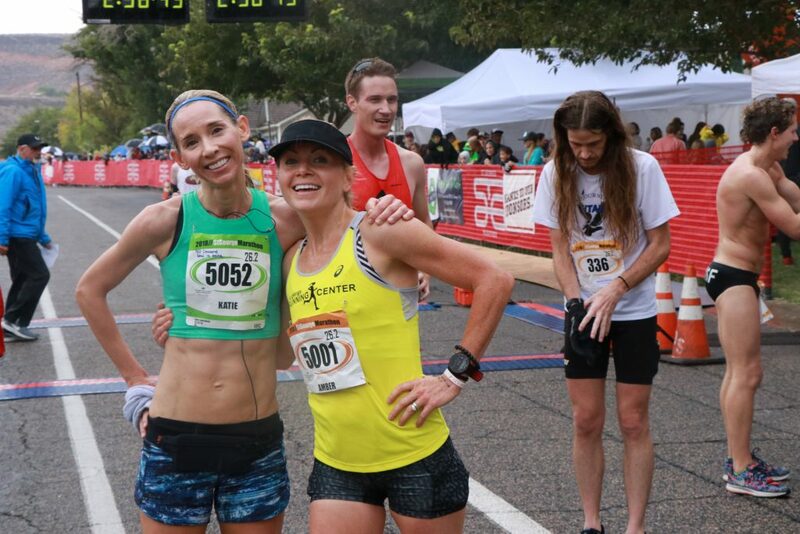 Second-place Heidi Pugmire, 35, of Riverdale ended up crossing the finish line in 2:42:09, while third-place female finisher Ashley Paulson, 37, of St. George finished in 2:42.35. 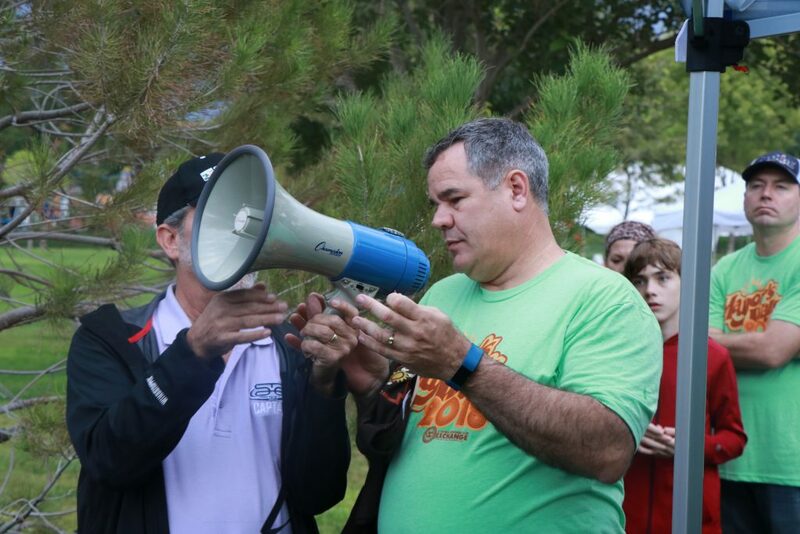 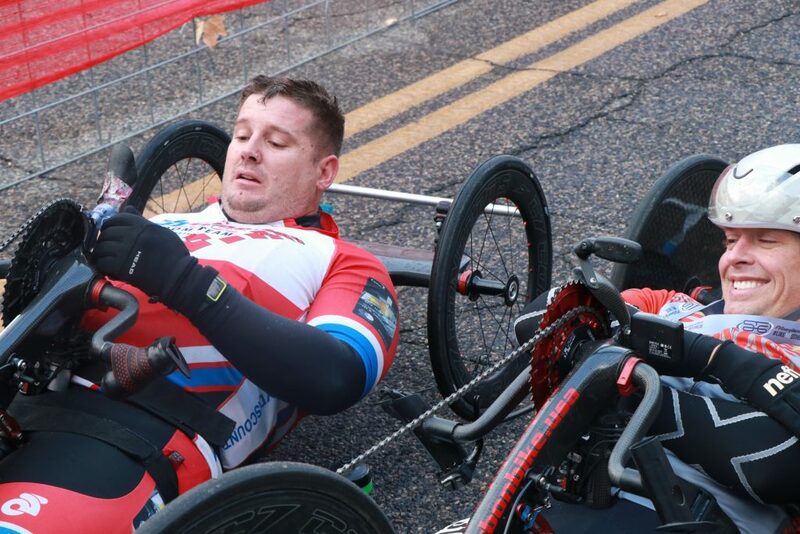 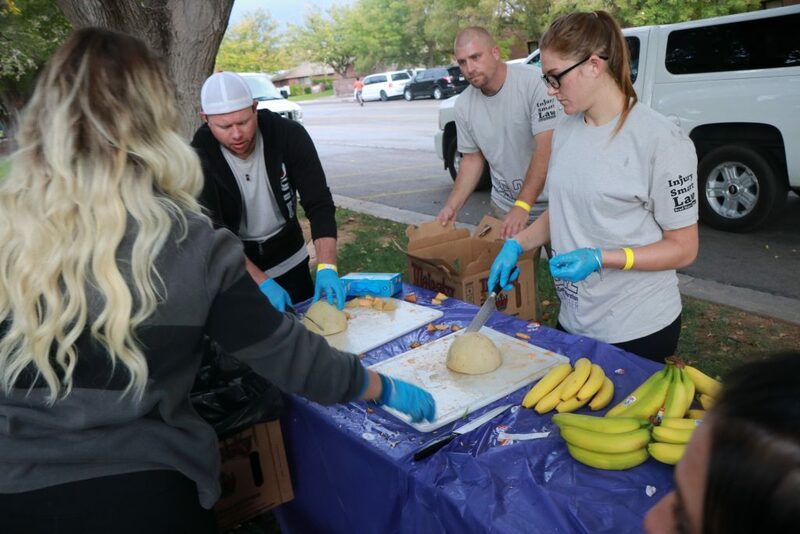 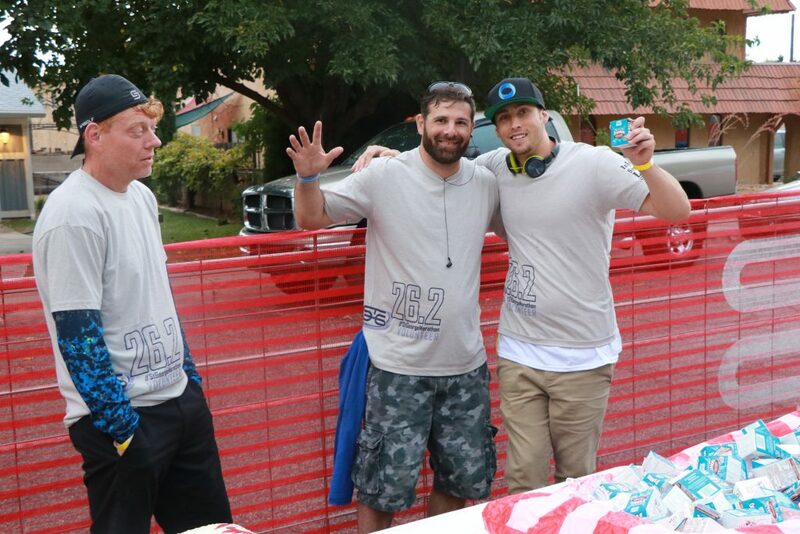 In the handcrank cycle division, Chris Sproule, 41, of Las Vegas and Travis Wood, 35, of Cedar City finished first and second, respectively, for the second straight year. 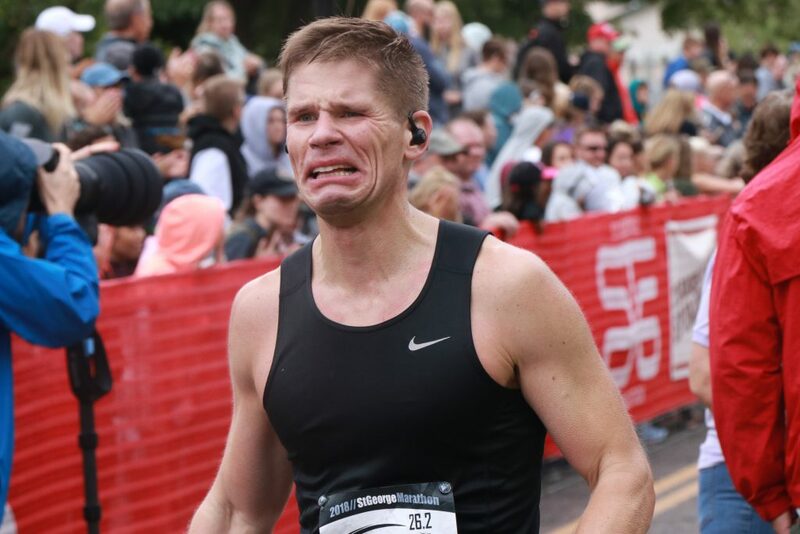 Their times were slower this year due to the rain, they said, but Wood added that at one point he clocked himself going 61 mph. 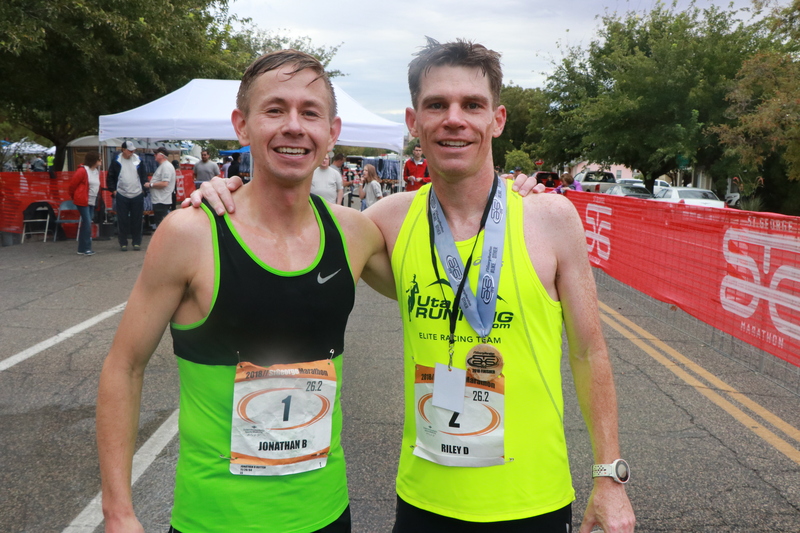 Sproule’s winning time was 1:00:09, while Wood finished in 1:03:22. 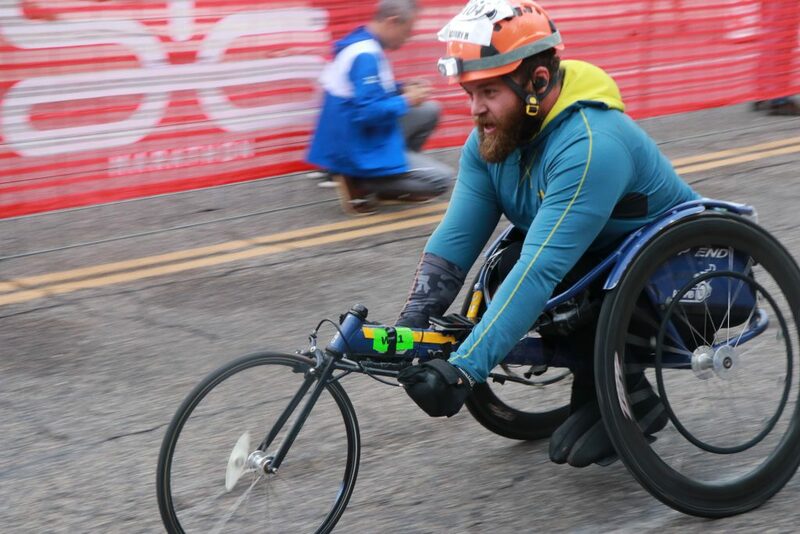 In the wheelchair category, Zachary Bastian, 32, of Rhode Island, placed first with a time of 1:43:36, a couple minutes ahead of runner-up 32-year-old Kacey McCallister of Oregon, who finished in 1:45:57. 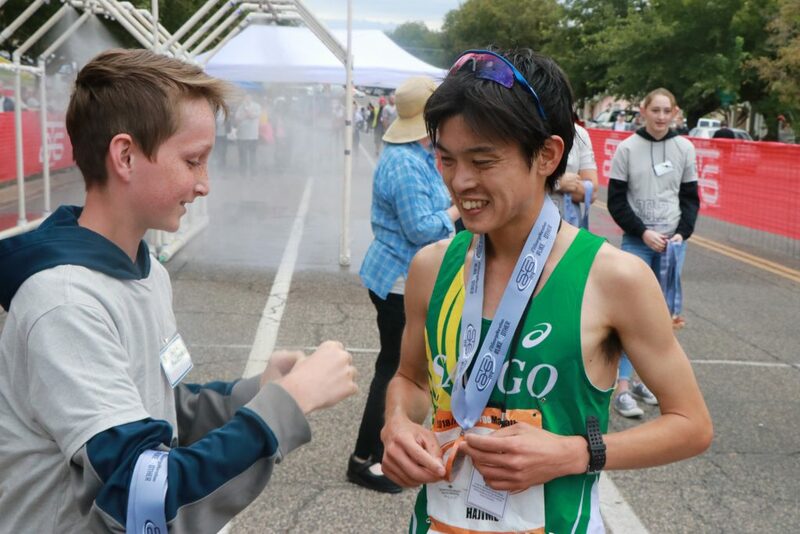 Among the other noteworthy finishers was Hajime Sakai, 24, of Ibigawa, Japan, who finished eighth overall among male runners with a personal-best time of 2:23:50. 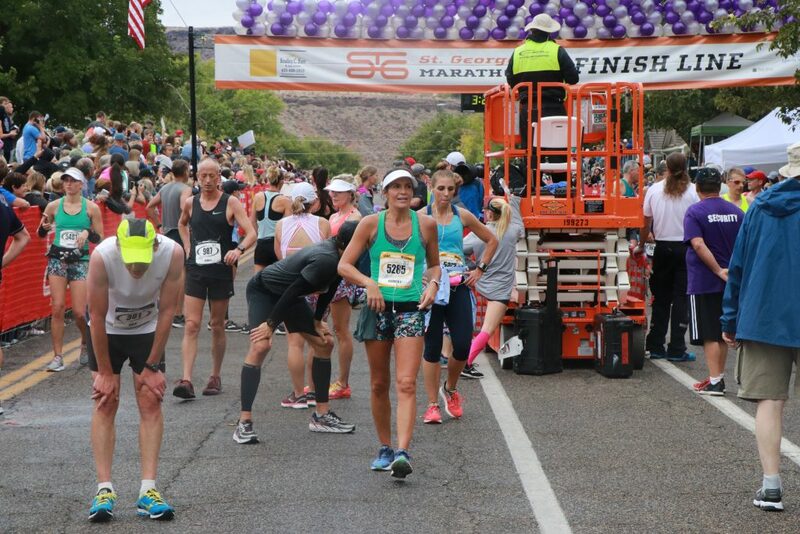 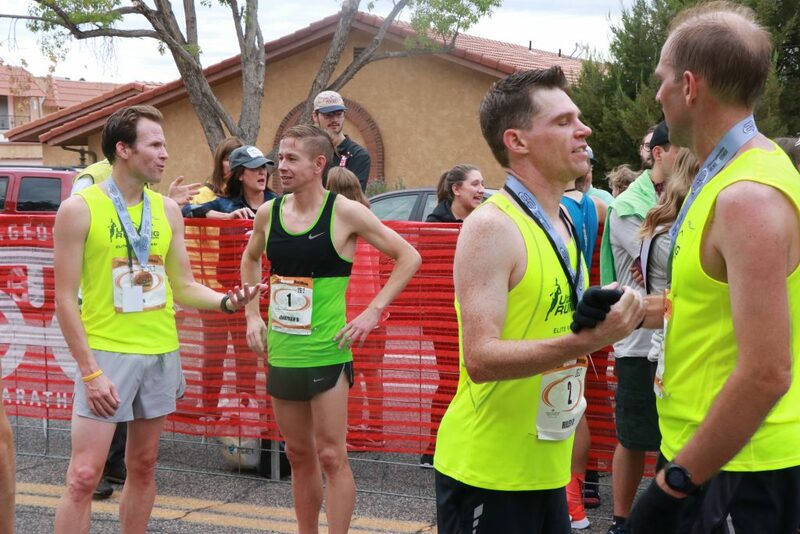 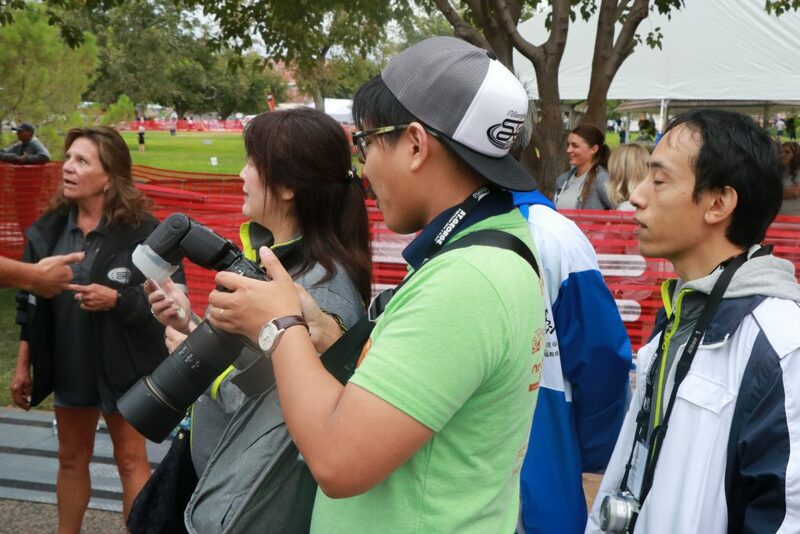 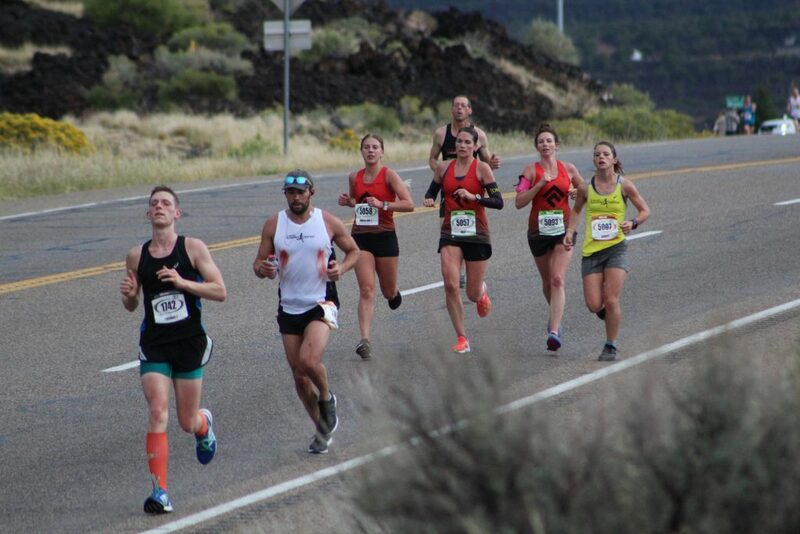 Officials with Ibigawa’s contingent said it marked the first time one of their city’s athletes had achieved a top-10 finish at the St. George Marathon. 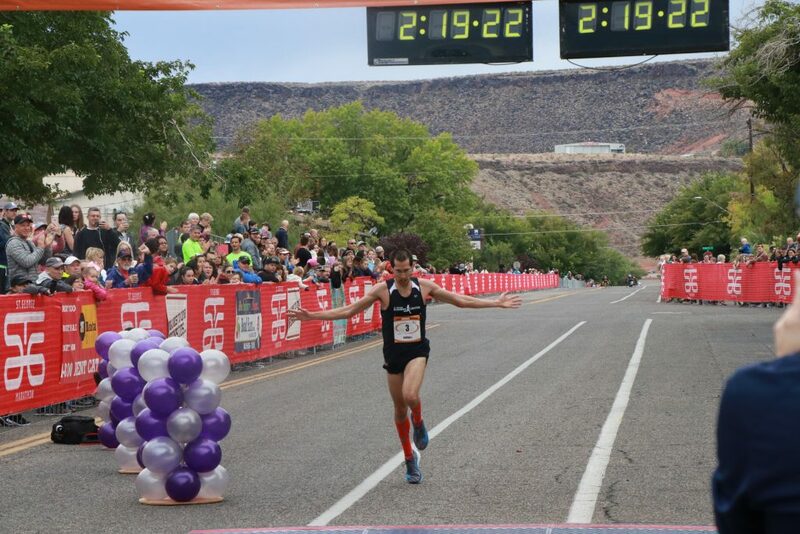 Ibigawa’s Rie Seko finished in 2:56:02, good enough for 12th place overall among female runners. 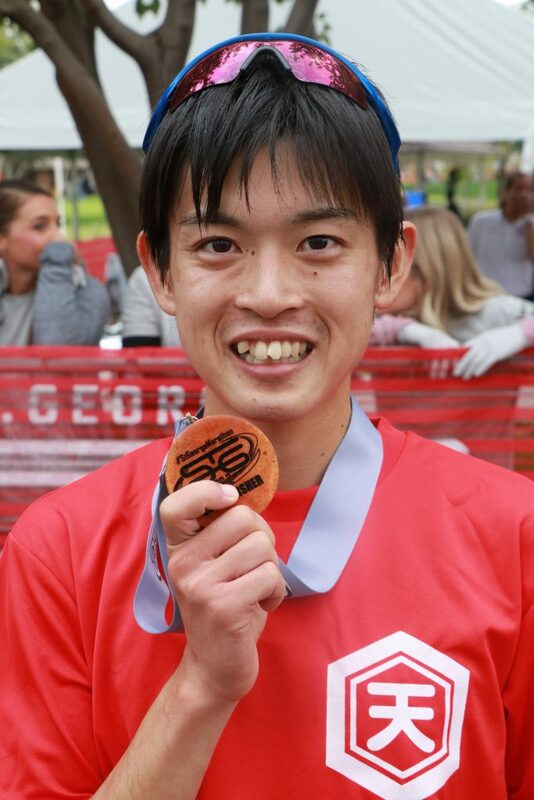 Also competing from Ibigawa in the master’s division were Yoshitaka Imamura, 45, in the men’s and Satomi Tsuboi, 46, in the women’s. 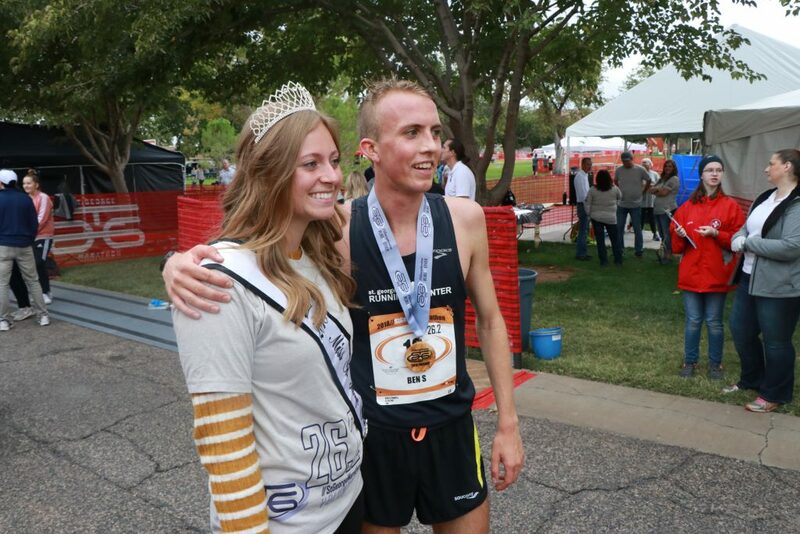 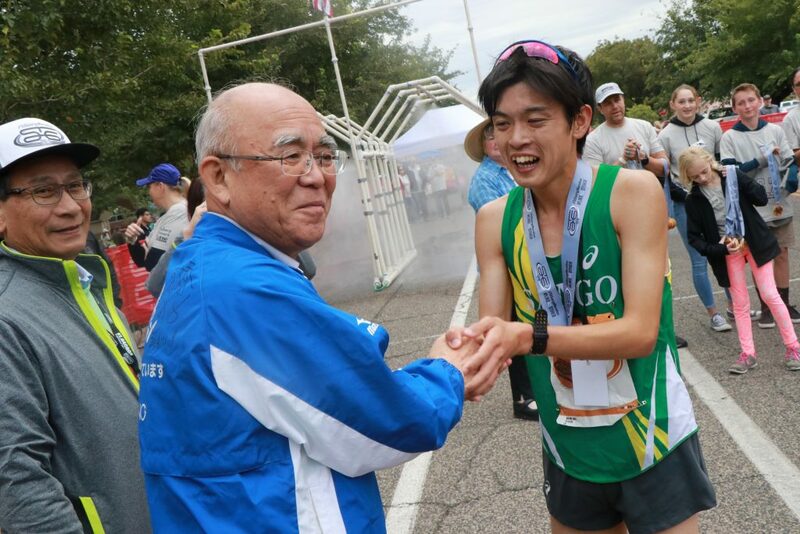 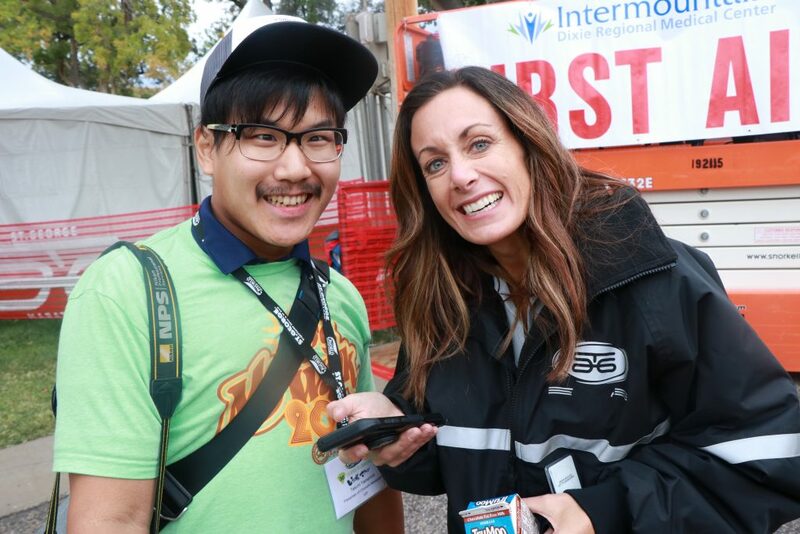 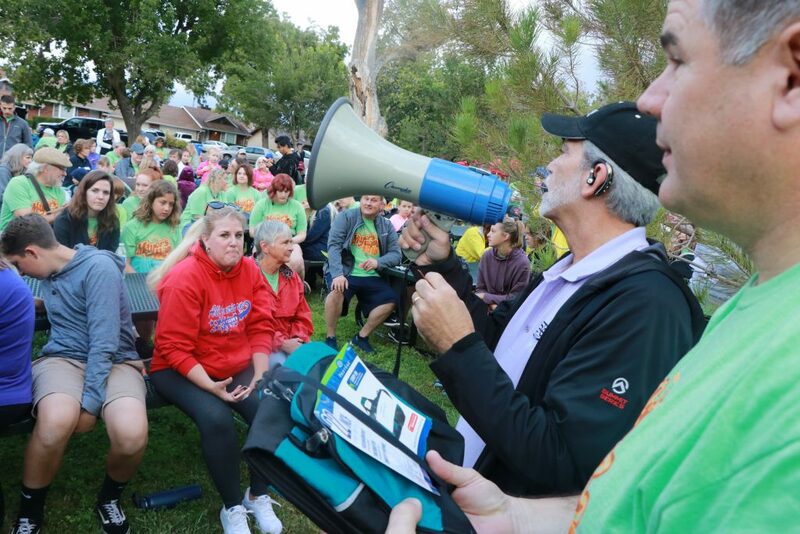 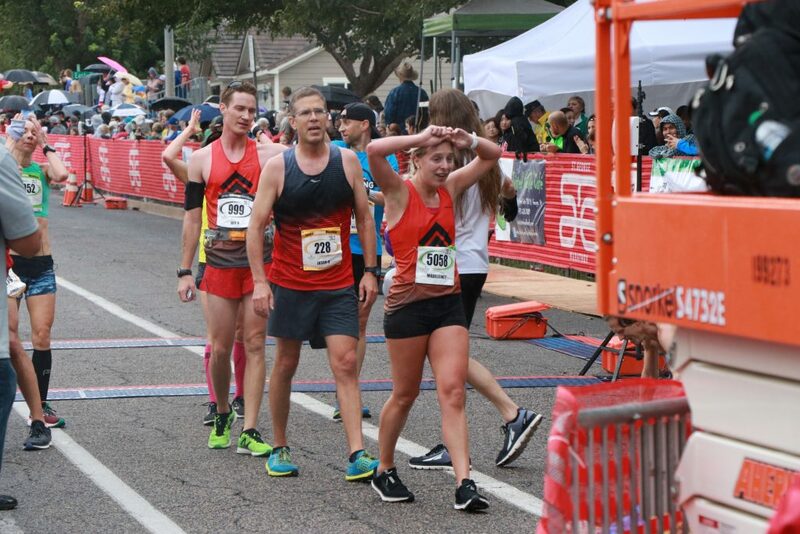 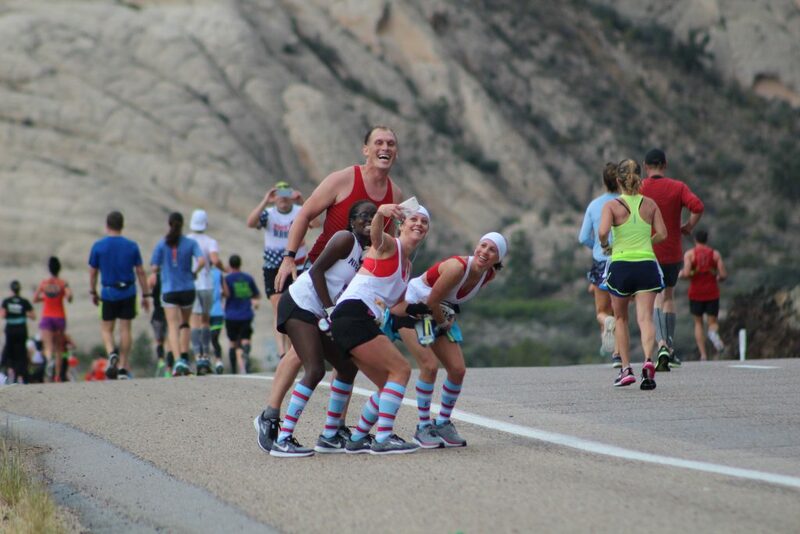 Ibigawa and St. George have been partners for the past 30 years, and as part of the sister city program, the top male and female finishers of the 2018 St. George Marathon won a trip to Japan to compete in the Ibigawa Marathon in November. 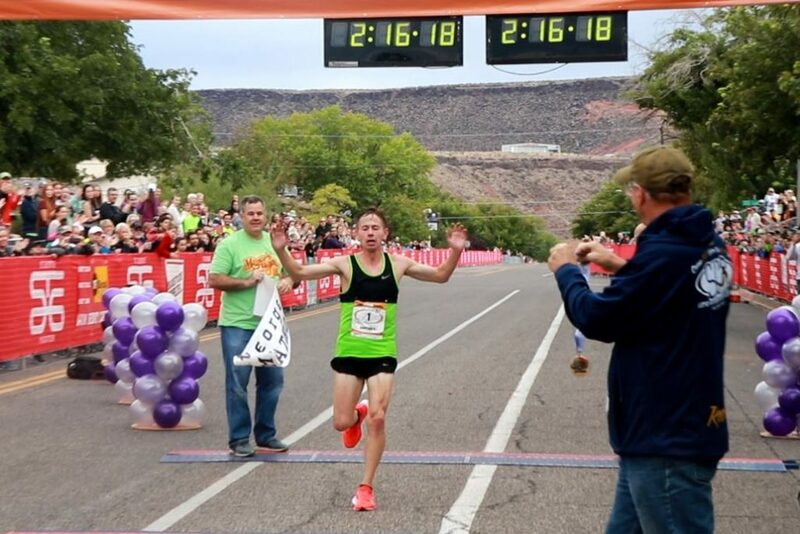 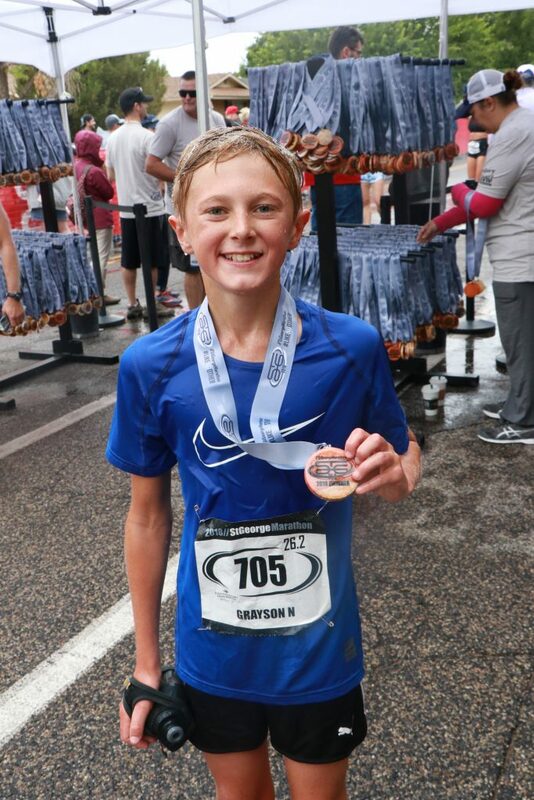 The first finisher under age 14 was 11-year-old Grayson Wolfe of Herriman, who said he was running his third-ever marathon. 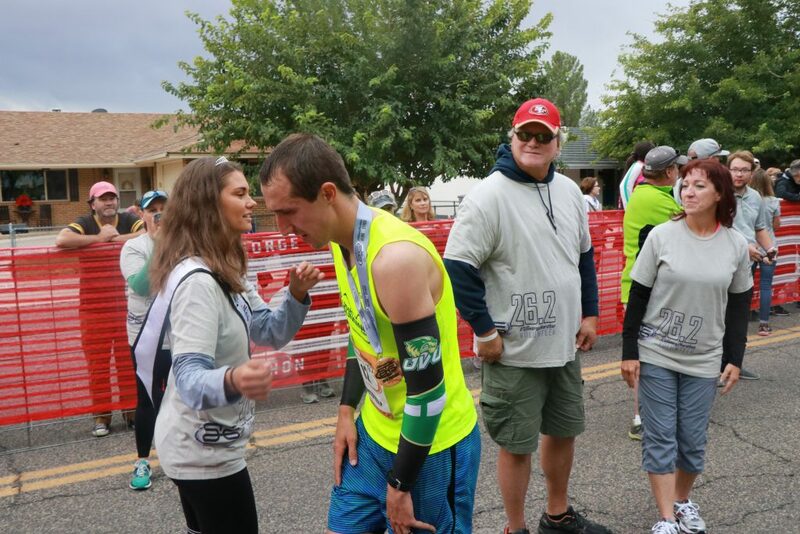 He finished in 3:13:40. 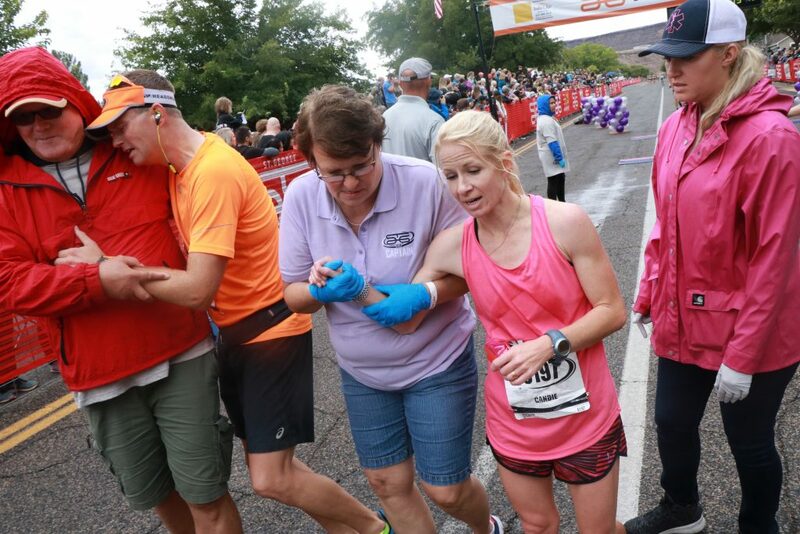 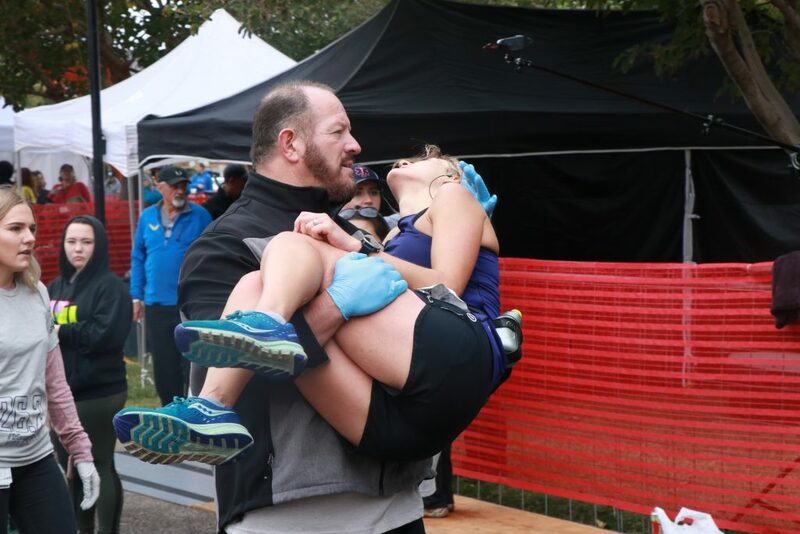 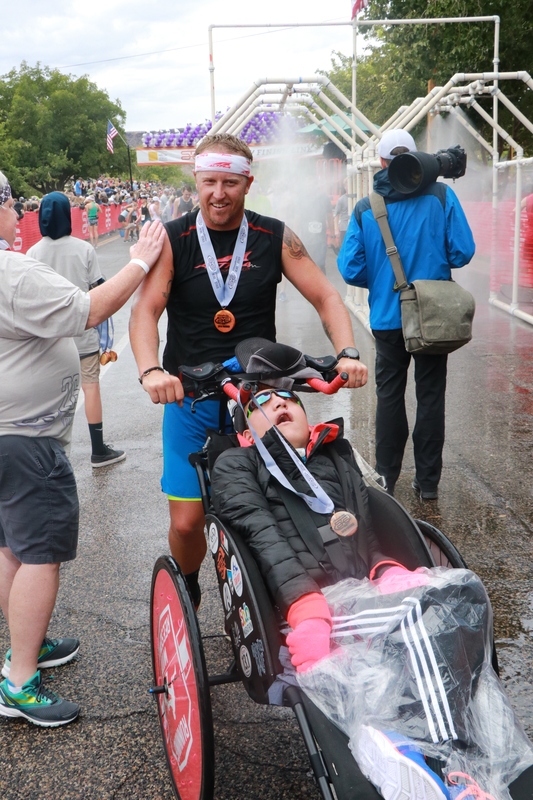 The top assisted female runner was Elsha Stockseth, 35, of South Weber, who was pushed in a wheelchair by 30-year-old Jonathan Moss of Ogden. 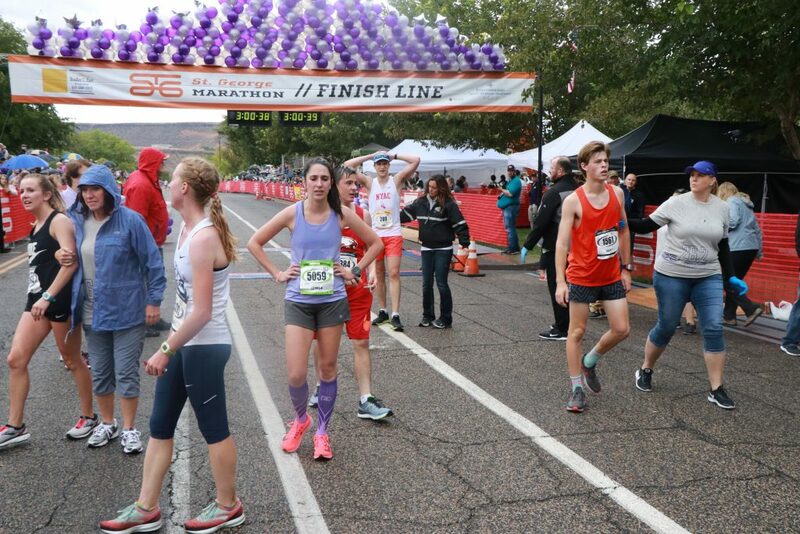 They crossed the finish line in 2:46.31. 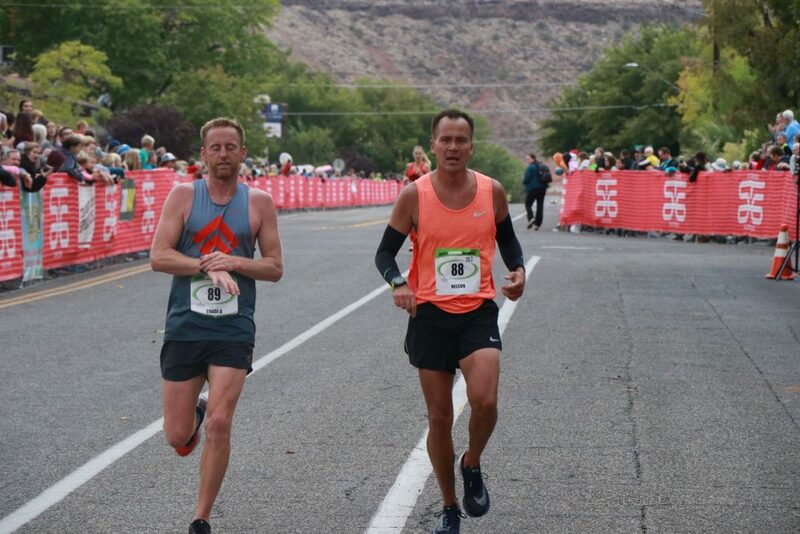 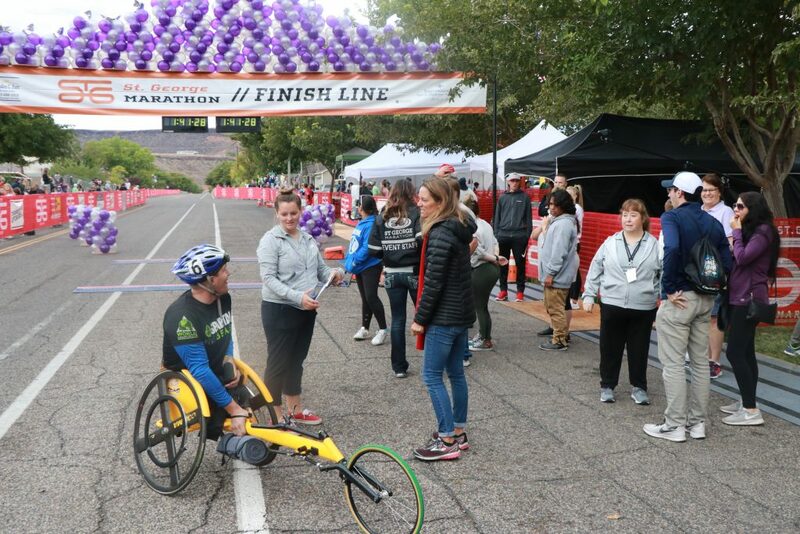 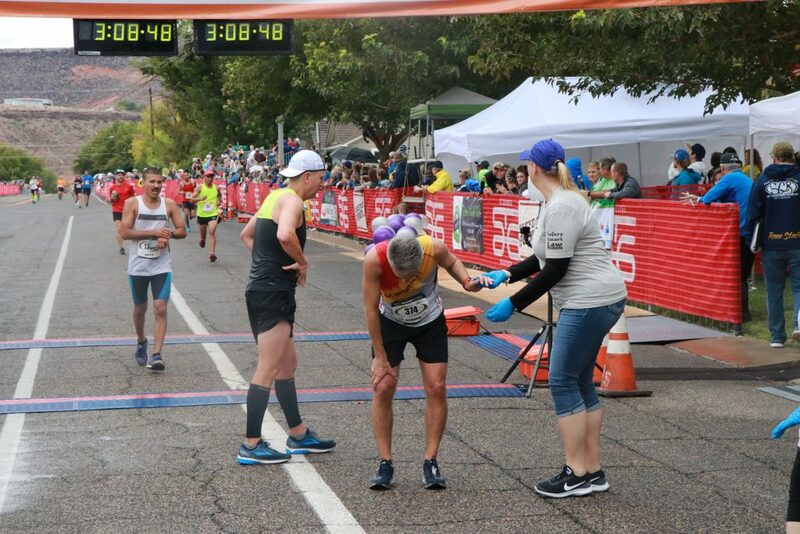 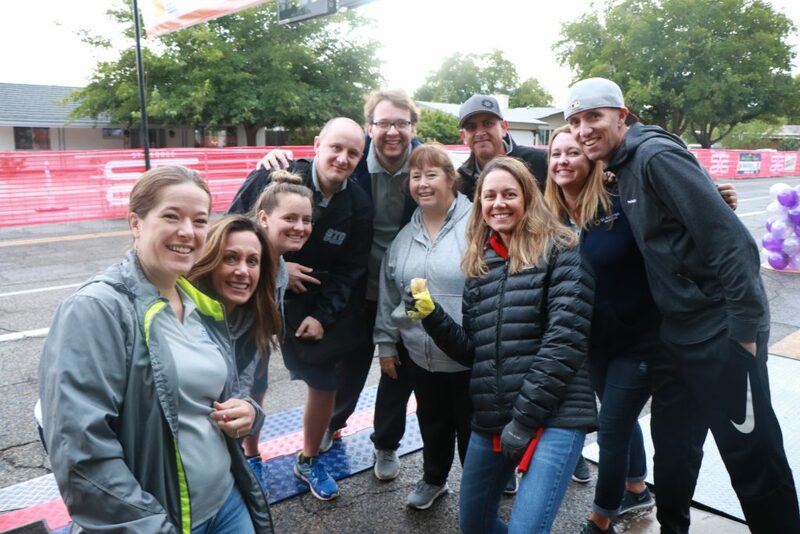 Providing a similar assist to the top male finisher in the assisted category, Heath Thurston, 40, of Washington City, pushed the wheelchair of 14-year-old Reese Thorne of Bountiful. 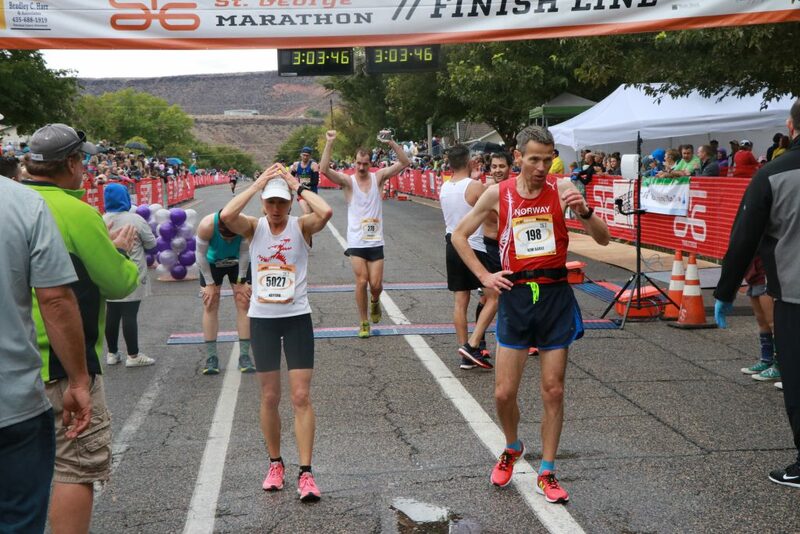 They finished in a time of 3:24:42. 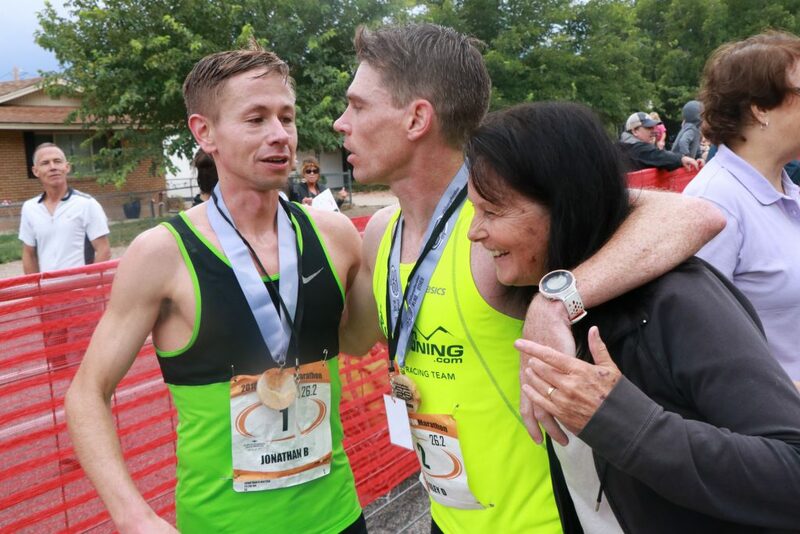 “I got to push him in a race once before, in February, and today was fortunate enough to be able to do it again,” Thurston said, adding that he is a longtime friend of Thorne and his family. 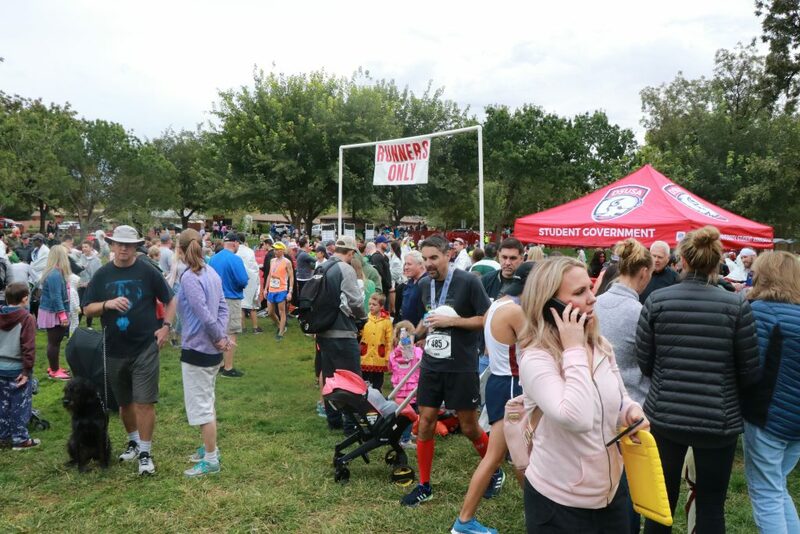 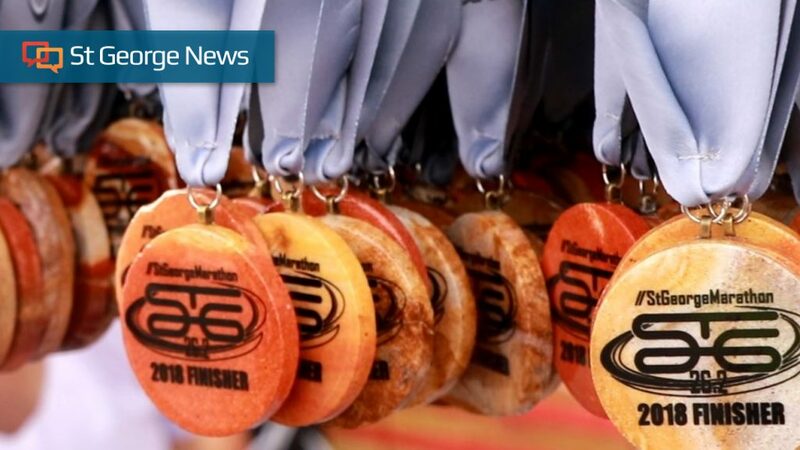 A total of 4,099 runners – 2,259 males and 1,840 females – completed this year’s race, with the last few runners finishing in just over six and a half hours. 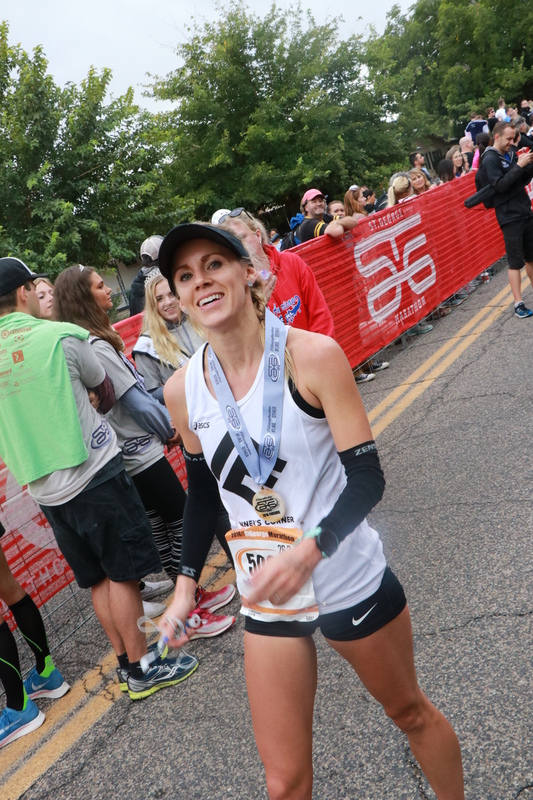 To view the complete race results, which are searchable by name or bib number, click here. 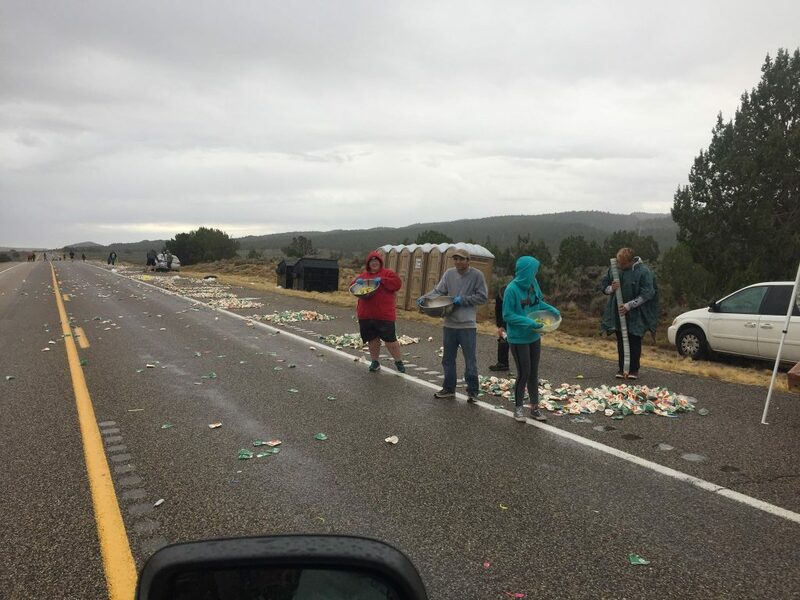 Updated Oct. 6, 3:30 p.m. to include full story and video.